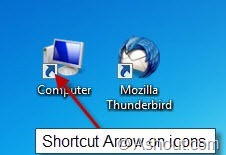 Have you Noticed that ugly arrow icons on your desktop icons? 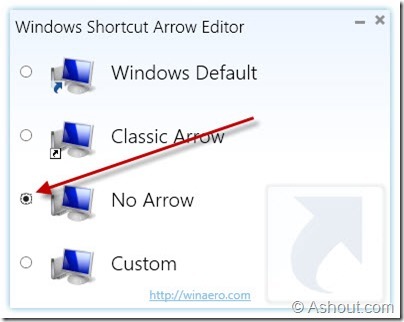 want to remove those arrows easily? 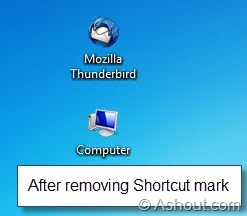 Then here is a best software to remove those shortcut arrows from icons and makes your desktop more attractive. In previous post I written an article on How To Easily Get Rid of Shortcut Arrows on Icons-Manual Method. Well that method also works fine with all windows operating system including windows vista, 7 and 8 32 bit and 64bit version. But if you followed that method to remove shortcut arrow, then you no longer be able to use “Pin to Taskbar” option. Moreover it somewhat tedious process to follow the guide. 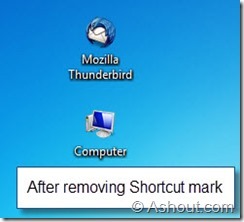 Instead of following that post, here is a new software which will allow you to remove shortcut arrow from icons more easily and without affecting the “Pin to Taskbar” option. 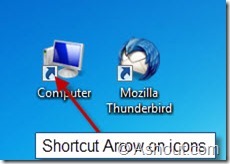 Windows shortcut arrow editor is a small and free utility tool which allows you to remove shortcut arrows from all windows operating system which includes windows vista, windows 7 and windows 8. It works fine with both 32 bit (x86) and 64 bit (x64) windows OS. This tool is very easy to use and you don’t need to install this tool to use. It’s a standalone application. Just launch that application and choose “No Arrow” option. That’s it. Now your icons will look more beautiful without having those ugly shortcut icons and without having any problem with “Pin to Taskbar” option.